This is a Scottish Championship counter this year on Sat July13th starting at 1.00pm. The race starts at Dundonnell MRT base at NH094 879 and climbs1062m to the trig pillar on Bidean a Ghlas Thuill a distance of 5.3km and returns the same way. The race is not flagged and generally follows the line of a rough hill path up a valley to a col at 069 849 and on to the summit. Car parking could be a bit tight so if you can car share where possible that would be great. If you arrive early there is limited parking at or close to the base, if this is full park at the Dundonnell Hotel car park where you will be directed to a parking space..
Full waterproof body cover, hat, gloves,whistle,compass and map must be carried. What a race to run. There is something about Stac Pollaidh that when on this lovely wee mountain or any other of these great mountains it brings the incredible words of Norman MaCaig to the mind. How can someone write such words that the hills come alive when you read them. the tossed, the stony limbs waiting. How I love these words and how they describe these mountains. I am amazed how few folk know this poem. It is full of many meanings to me not just the beauty of the area but the ownership of a land. Is it right that you can own such a place? We are so lucky to have the right of responsible access in Scotland. Let’s never lose it. Is this land not to be looked after for the future generations to appreciate? So many questions so few answers? Pete and Ally have just had a great week at Elphin. They had good weather and have climbed walked and enjoyed this incredible place. Ally loves it they had a magical cottage with views of Suilven from the windows. They are lucky they live in Cornwall another wonderful place but can be so busy. It is great that people still appreciate the wildness of Assynt and how important it is to us all. I love to live up here all these things I never take for granted. Every time I visit I learn new things. Yet I live in a wonderful place by the coast I never take for granted my local cliffs and the sea. The colour of the rocks, the views and the overall beauty of my village. I had a walk to Hopeman by the Coastal path and down to Cummingston my local cliffs the caves and the beaches. It was so Bonnie and peaceful. Pete and Ally at Cummingston – look at the colour of the rock. It was a busy few days with a journey to Ardgour on the West Coast. I had one day on the hill when the weather was cold and wet. I was on my own on the hill it was a cold day on Ardgour’s highest Corbett Sgurr Dohmaill. It was a day I could have done with some company. The rain and wind can take it out of you but even a bad day on the hill clears the mind. A better day on the hill and the warmth of the sun great company made it a special day. I got home another long trip and had a quick turn round. 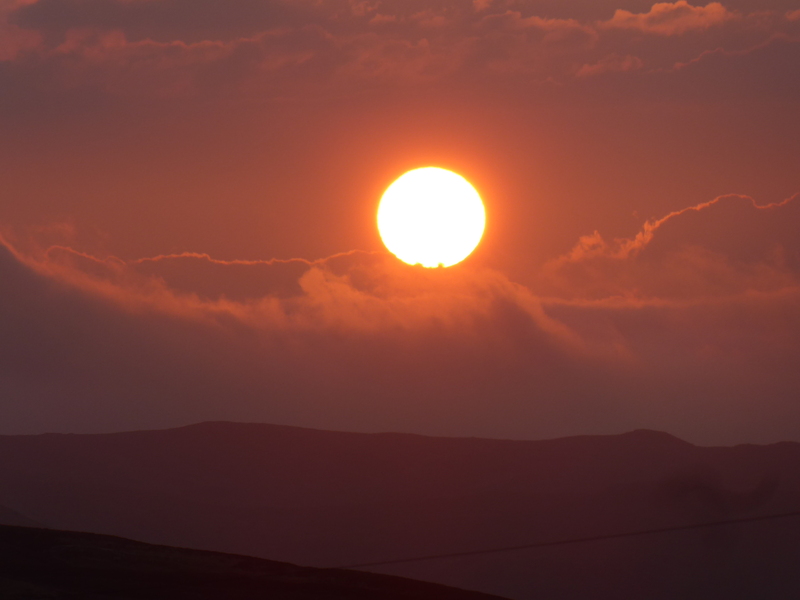 Next day I headed North to Elphin up in the North West. I had friends staying at Elphin and they had invited me to their cottage. It was a quick turn round of my gear and washing . It was to be well worth the effort. We had a great day out. It was sunny and the tops were clear you could feel the warmth on you all day. We had a great chat on the hill and still time to be alone if wanted . It’s easy to find an excuse when your tired or fed up or a bit down as so many things happen in our daily lives. I try to keep positive and it’s great to see old friends and meet new ones. Life is so short and I try to get something out of every day. I get far more out of the hills and wild places now. I see far more than a summit or climb or a tick in a book. The mountains can be tough as we all know but they can help heal as many are finding out. They give you time to think, clear the head and make decisions. They are better than any prescription from a doctor. Over the years I have found this out. Now many need their fix of the big sky and space. It is good to hear that folk are talking about things more openly. We must always be there for each other true friendships are in the good and hard times. They are the good news days and the bad we should be able to talk to each other . In the mountains we have a bond that is unique we trust each other on a rope on a climb or in bad weather. Yet when folk are going through hard times in life we must be honest and use that friendship and trust to help each other. This is a great piece by Magic Fowler one of the best Mountaineers in the world on his battle after a huge illness and how it effected his mind. Great to hear a man like that talking about Mental Health. Though a small peak it is superb a true classic you can scramble, climb and ridge walk all on this mountain.The mountain had changed over the years due to erosion and now a good path takes you round the back of the mountain. The views are wild it is a place to take it easy and drink it all in. The path was rerouted Many years ago as the erosion was terrible and now you can see the benefit of the new path. 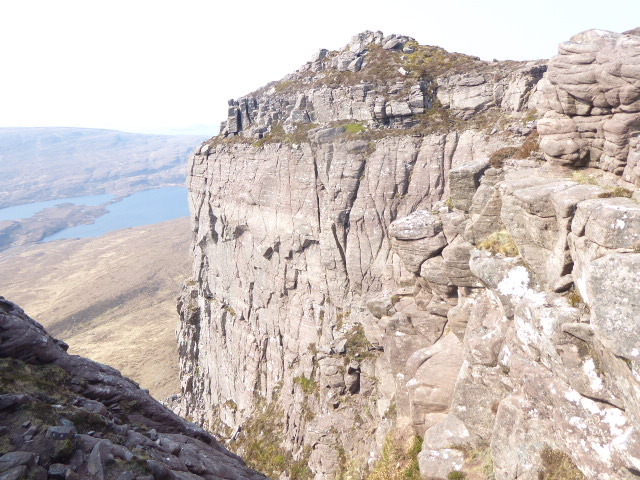 You soon head up onto the ridge but round the backside of Stac Pollaidh the views are wild. The lochans and the huge bulk of Suliven are eye catching as is the views out to the sea. This is the land of poetry to me and the peals are unique. We were soon on the ridge and from here it is endless pinnacles and fun. The weather was magnificent a bit windy at times but the sun and dry rock made it all so good. This hill though just over 2000 feet is a wonderful peak. I have spent so many days on it many in the past it is a hill for all seasons in the summer and winter. I have never been disappointed by it and rarely climbed it the same way. There is so much choice and the sandstone when dry is incredible. So many RAF Mountain Rescue cut there teeth here it is a place of gullies and cliffs big and small and on a bad day you can get shelter if you use your head. The ridge is a series of shattered pinnacles Towers and fingers of rock . The views are incredible and the path of you want skirts many of the difficulties. Yet to get to the summit is an adventure and a bit of scramble.. There are many little steps and descents.on your way. You have to take care there is a lot of loose rock and gravel about it’s not the place to slip. Yet the rock forms incredible shapes due to the weathering and today it was dry and the friction was great. To me the sanstone the colour and the light are unique every rock differing. . The true summit of Stac Pollaidh is at the western end and is more difficult to reach, and out of bounds for normal walkers. There are a succession of rocky towers requiring climbing or scrambling skills to ascend; most of these can be avoided to the north side but the final tower – which has to be reversed – is a short but steep pitch above a big drop. In winter this is interesting. It requires a high level of scrambling expertise, making the summit at 613 metres it can rank alongside the Cobbler it is now polished but still fun many say it is one the most difficult mainland summit in Britain?. The wee step is interesting we had the rope on and Ally made it look so easy after her day out on Cull Beag. It was great to see how she enjoyed it after her windy day on Lurgain Edge just along the road and Pete makes it all look so easy. We were soon on the summit and had lunch to one of the best situations in Scotland. Ally was great company she really enjoyed her easy day with me she climbed well and Pete was in his element. They live in Cornwall where Pete Guides but he loved Scotland and it was so great to be with them. The mountains on a day like this can bring great joy and the folk you are with make this so specail. Life stops you are in the moment and this is where we have special days while the world remains mad at times. . There is no rushing on this hill especially not today how many times have I been here and just enjoyed it. in winter is a different proposition it can be so serious when covered in ice despite its low height we have had a few fun days in the past,. We met a couple from Glasgow on the top enjoying a great day like us. They were young and keen moving with so much confidence on the rock. Oh to be young again. We could see the Summer Isles where I have sailed round with a pal John Coull sadly gone from cancer. We chatted about him and his life these are places to talk about pals. We then saw the huge cliffs where we lowered our stretchers training amid rock falling using one of our 9 lives.. The names of some of the routes here are are superb.. The summit crags of this distinctive and beautiful little mountain provide excellent quick-drying climbs, up to 100m in length. 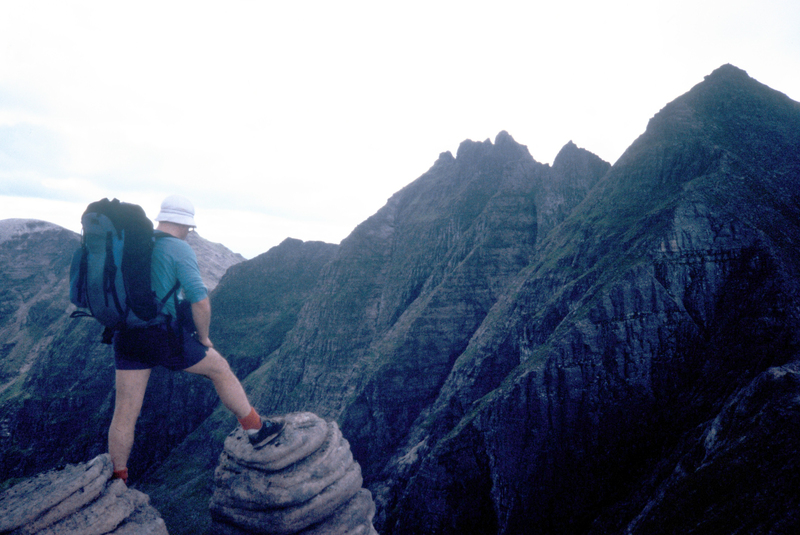 The pinnacles offer a good scramble with exceptional views. There are some great names for climbs here like “learning to fly” E4 6a and “Walking on air ” it is a wild mountain.and many of Scotland best climbers have left their mark. was time to go back sadly after some time the same way and Pete down-climbed the short walk easily we had a Safety rope. The sun was so warm the rock hot to touch it was a day to savour. Photo – Pete down climbing. We descended by a Gully and headed for the path to walk round the hill. This is a must after doing the hill the path takes you right round the mountain. We met a few more folk on the path and had a chat. Descending of the ridge into the darkness a lot of loose rock here but a quick way to the path. We were soon walking down at the car the heat was lovely and warming and sadly I had to get home. We had a chat and I thanked them for a great day.,They were heading of to Ullapool and me all the way home. There was moor burn on the hills the smell and smoke was so strong as I passed, The a succession of Police cars and an Ambulance came by at full speed on the tight road.very unusual for up North. I heard on the radio that there had been an road accident at Inchnadampth poor souls. The road would’ve shut most of the evening but Pete and Ally would be okay as the crash was further up the road from their cottage. The hills were all in view all the way and I was so glad I had come up to see Pete and Ally.There was procession of camper vans each one bigger than the next was on the road home all day. This is now such a different place in the summer. Yet to me I love it so much and with good folk it’s incredible. How I appreciate a day like this after a long winter. Now the Grandkids arrive today I am blessed . Pete and Ally who were staying in Elphin. They had rented a wee cottage and invited me over. It’s about 3 hours to Elphin from my house and despite my gear getting soaked from the weekend I got sorted. My gear was soon dry and washed and sorted out and the drive up to Ullapool was magical but the light was hazy with a strange light about. There was also a lot of wind. At least it was dry and I stopped for a brew at another pals house Mark near Ben Wyvis where we had a catch up. Ben Wyvis still had some snow and his garden full of Hinds watching us. It was then a drive along to Inverael and a short walk in the forest to stretch the legs. I had never stopped here but decided to have a break. This wee Forest was well worth visiting and the trees looking immense so many types all named for your education by the forestry . I had this all to myself spoiled or what. How many times have I driven by here. Just past the forest I picked up a young German hitchhiker heading for Elphin and Suilven he was in luck so in went his huge bag in the van and he got a lift. He was on a 3 year course in Fort William on tourism and was hoping to camp on Sulliven. From here we drove to a busy Ullapool where we stopped showing him the hills. The weather was still hazy but the mountains looked stunning. Pete and Ally were planning scrambling on Cull Beag nearby on Lurgain Edge in the wind it would be exciting. I dropped of our young lad to his adventures off he set on the path he would have fun. I called Pete on the phone they were on the top of Cull Beag the wind was blowing in the background and I drove back round to meet them. The views as always were stunning on the drive and they were just off the hill at the car after a great adventure. Ally had enjoyed her first big scramble even in the wind and their faces were windburned but they were so happy. This is what the mountains to me are about. It was great to hear Ally thoughts on the climb it takes you through wild country but she was buzzing and it was lovely to hear of her adventure. It was then back to their lovely cottage at Elphin for a super tea and a catch up. It was great to see Pete again I was on Everest with him in 2001 and Ally was great company he is a lucky guy. We must have bored her with tales but it was a great night. There was no sunset sadly last night the great peak of Suilven dominates with a pink glow around it and I stood listening to the wind and watched the hills fade into the darkness. What a place I love it. I was away early in the morning the forecast I got was not bad. I was on my own as some of my group from the Moray Club had other plans . One party were kayaking others doing other Corbett’s. I had already recce my route up Ardgours biggest hill. I was going in by bike to the mines at the base of my hill. About 20 minutes into my cycle the rain came on and was with me for the next 6 hours. The cycle was interesting and such a change from the previous day. The forestry track was wet and slippy and I took great care. It was hard to believe that this track was the main way to the mines many years ago. I could only imagine Bringing equipment and basics into this place would have been tricky to say the least. It’s roughly three miles on a rough track it was hard on the bike today. No sun at all just cold wet and windy. Heading up to the mines. The walk takes you through the wonderful Oak woods . The mineral Strontium is named after Strontian, where it was first discovered at the end of the 18th century. The Strontian mines, however, were more famous for a different mineral, galena, used for producing lead. In 1722 Sir Alexander Murray discovered a wealth of galena in the hills around Strontian. In 1725 he opened a mine, in partnership with such prominent people as the Duke of Norfolk and General Wade, who had recently become Commander-in-Chief of the British army in North Britain. At the end of the 18th century the mines closed due to flooding. With varying success, people re-opened the mines several times over the next 200 years. There is evidence of both open cast mining and deep shaft mining at Corrantee. It is not known when work finally ended at Corrantee, although other mines around Strontian were worked, on and off, until the 1980s. In the later 20th century mining continued for other minerals at Strontian, finally ending in the 1980s. The mines were located within the hills and the miners lived in isolation. They were reliant on ships bringing supplies by sea. When this failed the miners died of starvation. One occasion, when this happened, was in 1745 when local men stole gunpowder from the mines to aid Bonne Prince Charlie. As a result the English military closed the sea lanes and prevented supplies reaching Strontian, with devastating results for both locals and miners. Once deliveries successfully arrived on the shores of Loch Sunart, it was another job getting them to the mines. Ian Thornber has written an example of their resourcefulness: when cast-iron machinery weighing three-and-a-half tonnes was delivered to Corrantee Mine in 1867. There was no crane to lift it, and some suggested that the sides of the ship be cut off, but the mine manager – aptly named Mr Bright – succeeded in making a hoist to lift the precious cargo. The next problem was to get the machinery up the three miles of track into the hills. The route was so steep, however, that horse drawn carts could only carry one quarter of a ton. As a result, 150 men moved the machinery by hand, using a well thought out system of ropes and planks. It became an event, with bagpipes playing in the background while the men struggled on in teams. Ten hours after they started the men arrived at Corrantee mine. The exact location of Corrantee Lead Mines is grid reference NM 801 659. Take the A861 from Ardgour to Strontian. At the end of Strontian, cross the stone bridge and take the first turning to the right, signposted ‘Polloch’, follow this single track road along the riverside until you come to a junction for the ‘Ariundle centre’ and take the left turn, again signed ‘Polloch’. Climb a steep winding road (take care!) to the top of the hill and drop down to the loch below. Follow the road to a small metal bridge crossing the river at the mouth of Loch Doilet. The footpath to the mine starts just back from here, following the green right of way sign into the forest. Parking is available a little further along the road at the Forestry Commission car park in Polloch village. There is no official trail but there is a forest track which leads up a steep slope to the site. It’s a strenuous walk. Wear stout waterproof shoes as the area is often wet and marshy further up on the hill. The site is marked as a ruin on Ordnance Survey maps. I was in all my kit as I started up the hill this is wild land, pathless and hard going in the wind and rain. I left the old mine site up the Druim Leac a’ Sgiathain a narrow ridge leading over complex ground to Sgurr na h – Ilgginn At 766metres. The sky was grey and the mist down to 500 metres. Even with all my gear on it was cold if I stopped. The plan was get this hill done as fast my old body could cope. It is a long hard climb along a tricky ridge with so much up and down. The map does not show this Navigation would be tricky later on as the weather worsened. I got the odd glimpses of the hills through the rain and sleet it was not a day for the hills.i saw no one about today.